Time for some more charts. 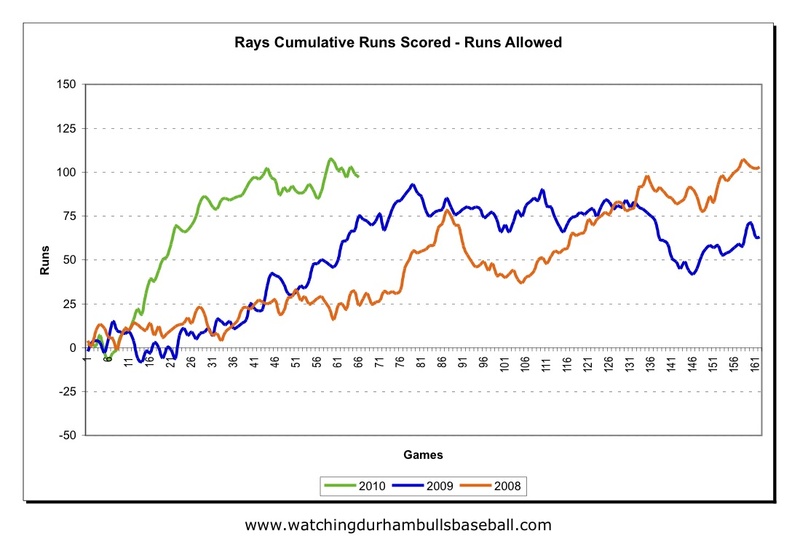 First, here’s the cumulative runs scored minus runs allowed. Looks pretty darned good even with the recent leveling out. 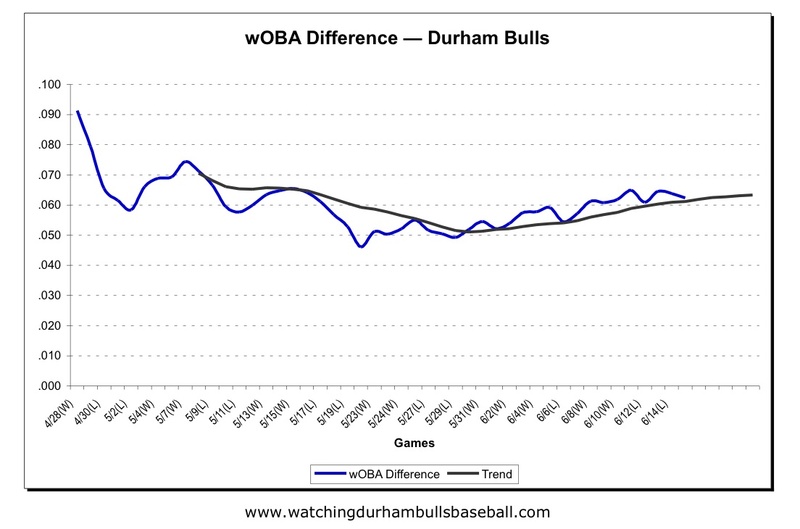 Then here is another look at team wOBA compared to our opponents’ wOBA. Back when I first began to look at this comparison I noted that I wasn’t sure just how useful it might be. I’m still not sure. 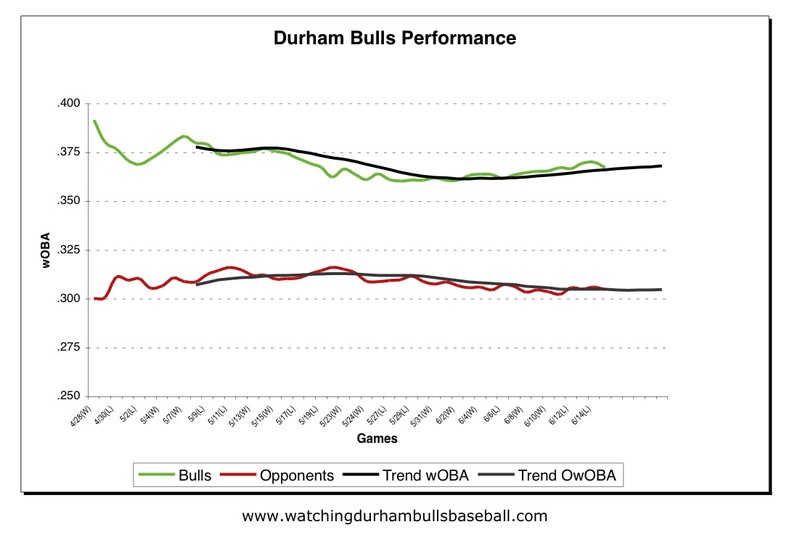 I’ve clipped off the first 20 games here just to reduce the early season variability. 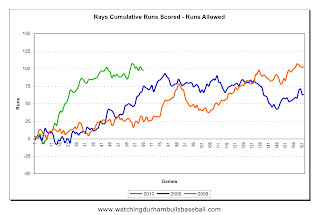 Now we’re dealing with well over 2,000 plate appearances so the curves should be slow to move. On the other hand, small changes could actually be more significant. 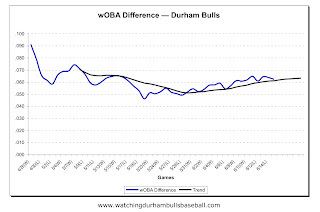 From this it looks like our offensive performance trend is slightly up while our pitching/defense performance is moving slightly downward. 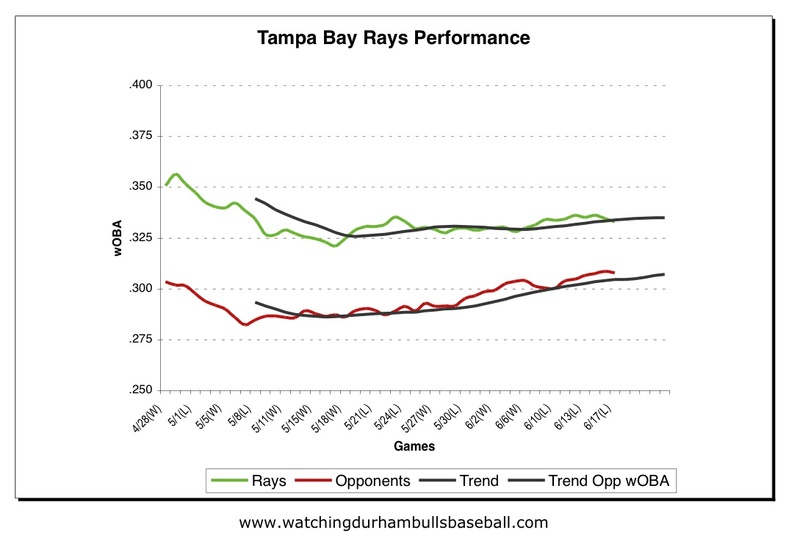 Note: all trend lines are 10-game moving averages, projected out for five more games. 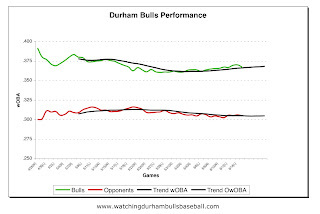 I can hear the legitimate statisticians out there grinding their teeth at a “trend of a trend” line, but, hey, I’m just a Bulls fan. Another way to look at these data is to simply plot the difference. That’s what this chart does. In this we lose some perspective because we can’t separate out offense from defense. 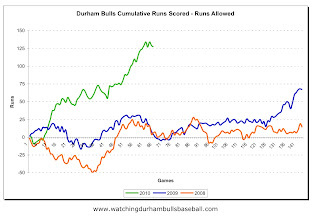 On the other hand it does show that in spite of a couple of recent losses, the trend is upward. Now, again just for grins, how about our buddies down on the Bay? 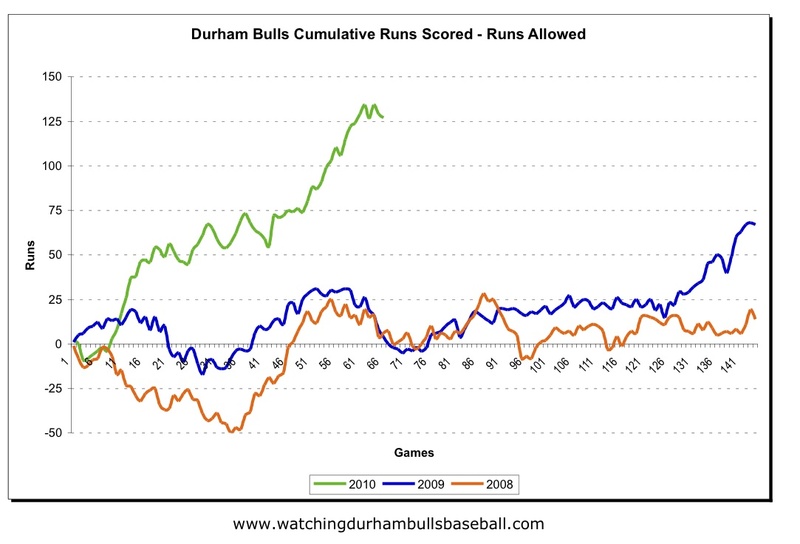 Their runs scored-runs allowed curve has leveled out recently, much like ours. On the other hand, you can see the challenge they face in living up to their brilliant 2008 run. 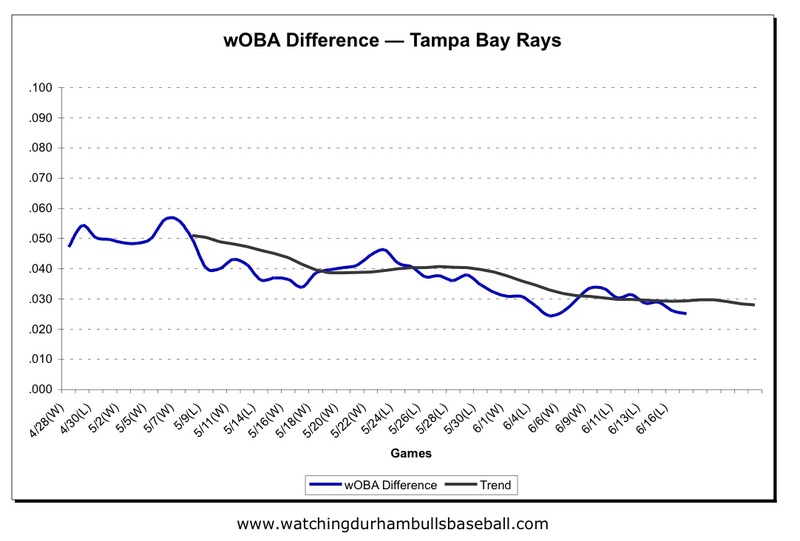 The wOBA charts are, if I were a Rays fan, disturbing. 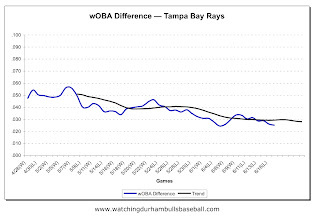 The upward trend in the Opponents’ wOBA is not a good thing. The narrowing gap and the trend shown reflects the not-goodness. 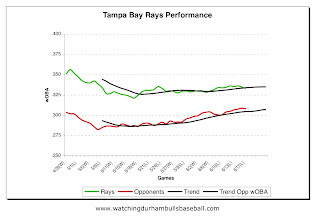 On the other hand, if the Rays hitters stay on track, they can make room for what is reportedly a fundamentally sound pitching staff (mostly ex-Bulls of course) to recover.